It's the age-old conundrum. You want an Ultrabook for the day and a gaming machine at night. 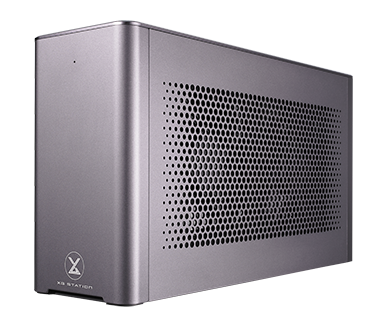 Investing in both sets of hardware is an expensive business, so much so that a number of companies have devised external enclosures able to house premium graphics cards that connect to these thin-and-light machines via Thunderbolt 3. One solution for work and play. The premise is simple enough. Use the grunt from, say, an 8th Gen Core processor - the Core i7-8550U can be reasonably potent if implemented well - and take advantage of the massive bandwidth available to Thunderbolt 3 for desktop-like graphics performance. That's the theory. The Razer Core is an example of such a product, but it is by no means the only one. 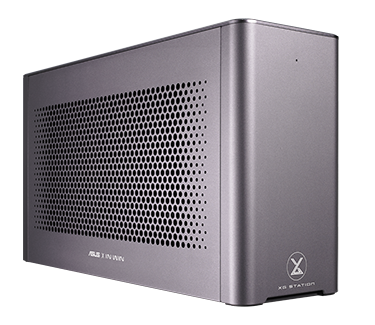 Asus has trodden this external path with the XG Station, first introduced in 2007, and now comes to market with a more professional model dubbed XG Station Pro. Let's take a closer peek. Gone is the space-age design and reliance of heaps of RGB. 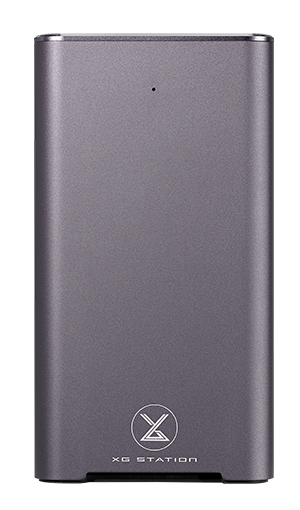 Instead, the Pro version uses a minimalist and elegant aluminium chassis designed in cooperation with case experts In Win. It's relatively small for an external enclosure, measuring 375mm long, 107mm high and 205mm tall, thanks to an externally-located PSU, but still somewhat large when sat alongside a modern Ultrabook. All told, the chassis alone weighs 2.93kg. Asus says there is Windows 10 support for Nvidia GeForce GTX 900-series (and later) as well as AMD's Radeon RX580/570 and WX7100 from the Radeon Pro line. Meanwhile, MacOS	(High Sierra 10.13.4 and later) is certified for the same trio of Radeon cards. 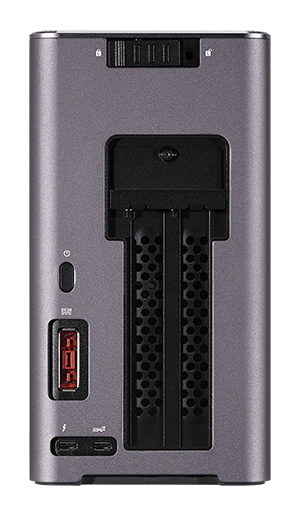 The approved list seems somewhat strange because the housing accepts 300mm-plus PCIe x16-connected cards that take up to 2.5 slots. In other words, practically every card under the sun. We had no problem running a reference GeForce GTX 1080 Ti. Back to the chassis itself. Construction is first class, helped by having smooth aluminium everywhere. Rather than using fancy lighting coming through a tinted window, a la the consumer-focussed ROG XG Station 2, there's a simple perforated panel on the near side that's lined with an internal dust filter. Should there be more I/O ports? The minimalist design extends to the back, where you'll find the proprietary power connector for the external 330W passive PSU repurposed from the GX800 laptop. Disappointingly, the I/O goodness of the XG Station 2 has been severely diminished here. Gone are the Gigabit Ethernet port, Type-B USB and four Type-A USB 3.0, replaced by a single USB 3.1 Gen 2 Type-C port. Bear in mind that this port provides only 15W of charging power, which is only enough for mobile phones rather than laptops. Given that an external graphics enclosure is absolutely set fair to replicate what a dock might offer, which would come in rather useful for many an Ultrabook, limiting the Pro's additional I/O to just a single Type-C feels strange. Heck, we wouldn't have minded seeing it equipped with a storage bay for holding your games. On the plus side, Asus includes a 1.5m Thunderbolt cable that enables fuss-free connection between enclosure and laptop - a 30cm cable isn't practical. Gaining internal access is easy. Simply flick the rear locking mechanism over to the right, push the top section forwards, and then remove the perforated aluminium side panel by pushing upwards. Doing so reveals the cavernous area within. 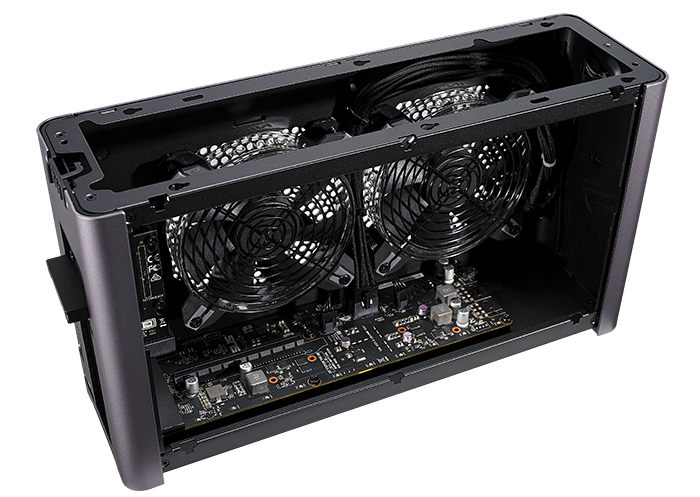 In Win provides the twin 'Polaris' 120mm exhaust fans that remain off at low temperatures. Their speed curve is such that they don't turn on, for our sample at least, until the GPU has kicked into top gear for at least 30 seconds. Asus says that they're programmed to only activate once a certain chassis temperature has been breached, and that their speed is set by an internal temperature diode on the PCB. The clear benefit here is that the enclosure ought to be silent when paired with a modern graphics card. If you don't like the default fan-speed configuration, their speed curve and activation temperature can be modulated within Asus' GPU Tweak II program. By default, they are pretty quiet at all times; you can hear the graphics card's fan under-load hum far more clearly. Neatly tucked away in the top-right section are two sleeved 8-pin PCIe connectors for the graphics card. Length is adequate and, given the 330W external PSU rating, we'd have no problem in using any single-GPU GeForce or Radeon at stock speeds. The Thunderbolt connector is usually supposed to charge the host laptop and provide adequate juice to the graphics card at the same time. In our testing with a Dell XPS 13 (9370), the XG Station Pro would not charge the Ultrabook - a Dell message stating the laptop requires at least 27 watts kept popping up - so consider this if your laptop doesn't have a separate charging port. By default, the 10 LEDs glow white but can be changed to any RGB colour via the lightweight Asus Aura utility. There's an option of colour-coordinating with an Asus Strix graphics card, and cleverly, you can plug the dual In Win fans into said card's FanConnect header for more temperature-focussed airflow. Yet having an external enclosure for that shiny Ultrabook still remains a relatively expensive proposition. The XG Station Pro retails for $329 (£300, if you can find it). Add to that the obvious cost of a card and the final total, with a GeForce GTX 1080 Ti, for example, can come to close to a grand. But when has getting high-quality graphics from an Ultrabook been any different?